Persecuted Christians in Nigeria cling to hope that change will come with every election. However, with two Muslim contestants dominating this year’s race, they don’t have much to hope for. Nigeria’s current president, Mr. Buhari, has been ignoring the cries of persecuted Christians for years, centralizing control over the government’s security apparatus into the hands of Fulani leaders. Mr. Buhari’s challenger, Atiku Abubakar, is a Fulani Muslim. Even if Atiku does win the election and is motivated to change the situation, the military, police, and security apparatus will still remain in the hands of Muslim leaders, who have purposefully chosen to remain on the sidelines. Many Nigerians fear that Mr. Buhari will use his top-heavy influence over political operatives to maneuver the election to his favor. The race is already making headlines across national news, with a recent report that two offices used by the general election commission were burned down in the last week. A number of suspicious arrests of key campaign officials have been made, including the arrest of Ben Bako, one of the campaign directors for the People’s Democratic Party (the party sponsoring Abubakar). 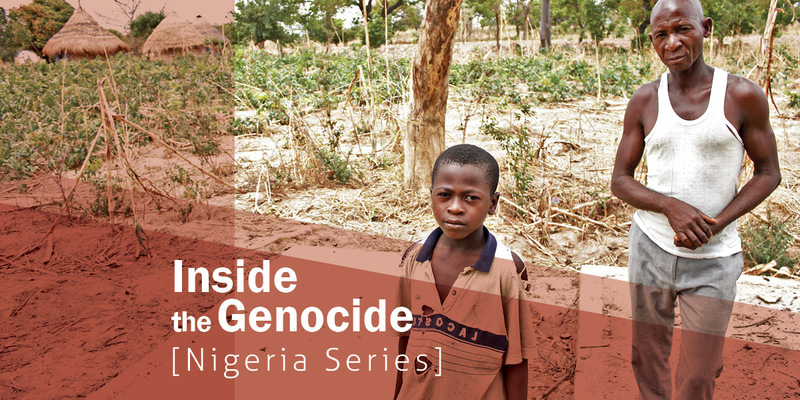 This week, ICC will be sharing more insight into Nigeria’s Christian genocide, Mr. Buhari’s administration, the return of Boko Haram, and more. Stay tuned. Nigeria’s Christian farmers are no strangers to suffering. They’ve witnessed 50,000 to 70,000 deaths of their own people over the last two decades. They’ve seen their fathers and sons gunned down and their wives and daughters taken captive. The senseless killing spree is not random. Two Islamic terrorist groups, Boko Haram and Fulani militants, are responsible for this violence. They’ve targeted Christian communities under an umbrella of government ineptitude (or purposeful inaction) and ignorance on the part of the international community. Boko Haram operated for years without any effective pushback from the government, until they started attacking government facilities and kidnapping girls. Boko Haram’s infamous kidnapping of the Chibok girls brought it to the forefront of the world stage, forcing the administration’s hand. The resulting worldwide outcry surrounding the Chibok girls finally pushed the Nigerian government into action. Boko Haram faded out of the picture, providing some relief for Christians. That relief was short-lived, however, as an ISIS-affiliated faction of Boko Haram now gradually advances in northern Nigeria, attacking villages and creating chaos across the nation in the name of Allah. Christian families, like the Yakubus, have been suffering at the hands of the Fulani Islamic militants in Nigeria’s massive Middle Belt for twenty years now. Prior to 2001, nomadic Fulani herdsmen and resident Christian farmers occasionally clashed when livestock grazed on crop lands, but the Fulani herdsmen would apologize and make amends to the farmers. The militarization of the Fulani in 2001 triggered a new level of conflict between the two groups, as the herdsmen began taking land by force. Christians fell easily under the firepower, and survivors of the attacks became empty-handed refugees. They lost their land, their homes, their trade, and even their families. Though the death counts approach genocidal levels, the Buhari administration has refused to recognize the Fulani attacks as anything more than “land scruples.” Buhari’s passivity has resulted in an increase in Fulani violence as the herdsmen test the limits, attacking even more villages than they did before the administration came to power. These changes have rewritten the map of Nigeria, as large droves of Christian refugees flee from their villages to the surrounding cities for protection.